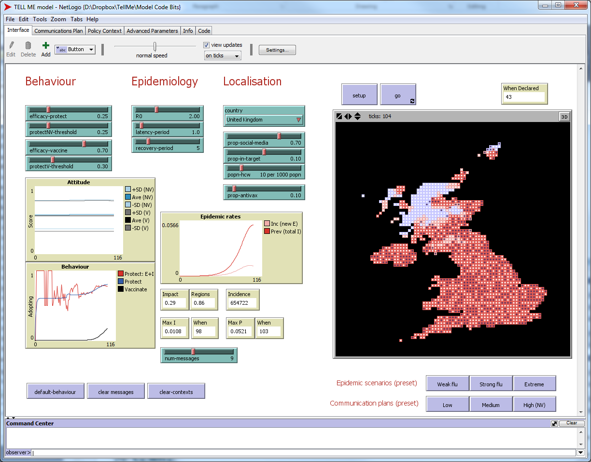 CRESS (Centre for Research in Social Simulation at the University of Surrey), partner of TELL ME project, has released a prototype software that simulates the effect of health agency communication on protective behaviour (such as vaccination or hand hygiene) and its contribution to epidemic management. The prototype has been developed in conjunction with other TELL ME project partners, health communication experts, epidemic managers and other stakeholders. Simulated individuals have different characteristics (such as attitude and media access) and react differently to the same situation, and perceive their environment (such as proximity to the epidemic), reacting differently to different situations. The model has been parameterised with available empirical data. The prototype can be used to compare communication plans, helping users to understand the complex interactions between communication and behaviour. The development of the model also highlighted what information needs to be collected about the effect of communication during future epidemics to be able to create a full communication planning tool.